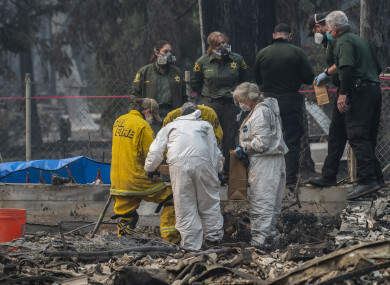 THE TOLL FROM the deadliest and most destructive wildfire in California’s history rose further at the weekend to 77. “One human remain was located today,” raising the toll by one in the so-called Camp Fire which broke out 10 days ago in northern California, a statement from the Butte County Sheriff said this morning. Authorities don’t believe all those on the list are missing and the roster dropped by 300 yesterday as more people were located or got in touch to say they weren’t missing. There are also understood to be duplicated names on the list. Firefighters managed to expand containment to 65% of the 234-square-mile burn zone. Rain is forecast for midweek in the Paradise area. The National Weather Service, however, also said the area could get 32kph sustained winds and 64kph gusts, which could make it hard for crews to keep making progress against the blaze. Rain, while a relief for firefighters on the frontline, could complicate the search efforts. Email “77 dead, 993 missing and 10,000 homes destroyed as California waits on rain ”. Feedback on “77 dead, 993 missing and 10,000 homes destroyed as California waits on rain ”.